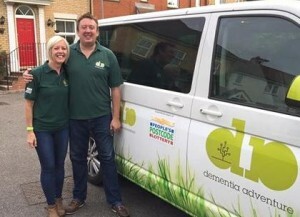 Behind the scenes at Dementia Adventure there is a fantastic team. Each team member has the desire to support and improve the lives of those living with dementia and their carers. Caroline volunteered to be part of a team taking four men living with dementia and their wives on a ‘Take Five’ holiday to Godshill Park Farm on the Isle of Wight. The requirements of each person living with dementia were varied. Two of the men had difficulties with mobility, others had difficulties with speech. The holiday was well planned to make sure there was something for everyone, including trips to the botanical gardens, Osborne House, a ride on a steam train and a visit to the animals on the farm itself. Caroline noticed that three of the men had very little speech when they arrived and by the end were chatting together as friends – their personalities and sense of humour shining through. This was a real highlight for her. Dementia Adventure’s ethos is that getting people with dementia outdoors and connected with nature really does improve wellbeing. This is a great volunteering opportunity for those with an interest in the outdoors and all kinds of outdoor activity Those who have worked with people living with dementia or cared for someone themselves may find this a rewarding volunteering role. Training and support is provided and volunteers are not expected to provide personal care.